One of my favorite things to make and eat is pizza. Most people think of pizza as the ultimate cheat food, if they're following a healthy diet. On the contrary, I think pizza can help compliment any healthy diet, if you just employ a few guidelines. First, use a whole wheat pizza crust. Whole wheat is much healthier than its white crust counterpart. Second, go easy on the cheese and add extra sauce. Last, use lean meats and plenty of vegetables. Now, I've made plenty of pizza doughs and sauces and if you've never tried it, you are really missing out. Yes I know that you don't have time with work, school, kids, nagging family members....blah blah blah. But I promise you, the time and effort with be worth the investment. I usually make my pizza dough a day or two in advance because developing flavor takes time and care. I chose "whole wheat," simply because it's better for you and because I don't eat refined or white breads. If you are not a whole wheat fan, then you can try making a "transitional" pizza crust, a mix 50% white and 50% whole wheat flours. I've had exceptional results with Peter Reinhert's method of bread making from his "Whole Gain Breads" I consider him a genius when it comes to artisan bread making and his methods have proven extremely successful results. I used his recipe found here. I used a "biga" starter and soaker. Starters such as "biga' (Italian) and poolish (French) help to impart extraordinary flavor by a delayed fermented process. A soaker is necessary with whole wheat flour to soften the wheat grains, to help produce a lighter dough. I chose a Hawaiian style pizza, but I don't regularly eat ham, so I replaced that with a pineapple-ginger marinaded chicken breast cut into chunks. I made a tomato base pizza sauce made with roasted garlic, onions, and a habanero pepper, Italian seasonings, pineapple juice, and red wine. I used a store bought 4 pizza cheese blend and I "lightly" dusted the pie with cheese. The only problem that I did experience, was trying to get the entire crust as crisp as possible, before the toppings started to burn. Even though I do possess a pizza stone, my electric oven still doesn't get hot enough to accomplish this. Next time, I will try prebaking the crust before I add toppings, that way, the crust should have enough time to crisp up before the toppings start to burn. Enjoy! Keebler's Pecan Sandies were always a staple growing up in my household. Their presence was brought on by my father's incredible love for them. Surprisingly, they were the only few "sweets" that he would often buy. My mother on the other hand was more smitten with Keebler's chocolate chip deluxe varieties. Although I did eat pecan sandies (often times because they were the only things around), they didn't leave the same intimate satisfaction that chocolate chip cookies often did. No, my love for pecan sandies didn't bloom until later, when I could truly appreciate them. Pecan sandies are shortbread type cookies not too sweet, but rich and buttery. Their crisp and crunchy texture, makes them exceptional paired with coffee, tea, ice cream, or an ice cold glass of milk. The texture alone is one that seems to just melt in your mouth. I wanted this cookie reminiscent of Keebler's famous "sandy" cookie, but far superior in taste and flavor. Dark chocolate pecan came to mind, because it's my favorite of their sandy variety. I always like making cookie dough a day or two ahead chilling it in the refrigerator or freezer. This way, the dough has time to relax, the flavor is intensified, and the dough spreads evenly. I chopped the toasted pecans finely to create a more "nut meal" type texture acting as a flavor enhancer and providing a little more "flour" like structure. Since I didn't have mini semi-sweet chocolate chips, I took the regular sized one and gave them a ruff chop. In a medium sized bowl whisk together flour, soda, salt and mix well, then set aside. In another medium sized bowl cream butter and sugar together until the mixture is light and fluffy. Then add egg, vanilla, and water. Blend for about 5 mins to further lighten the batter. Setting the mixer on low, combine flour slowly and blend until combine. Then add toasted pecans and semi-sweet chocolate and blend until combined. Transfer the mixture unto the counter top laced with plastic wrap. Wrap up the dough and shape into a log 2 inches across. Chill the dough for at least 4 hours, but a day or two for maximum flavor. Preheat an oven 350 degrees and remove the chilled dough from the frig. Next cut each cookie about a 1/2 inch thick and place them on a lightly greased cookie sheet. Bake for 12-15 minutes until lightly brown. Place cook sheet on a cooling rack and cool for 5 mins. Remove the cookies from the sheet and place them back on the rack allowing them to cool completely. Enjoy! A few weeks ago I was visiting with my father and my grandparents for dinner and the subject of cheesecake came up. 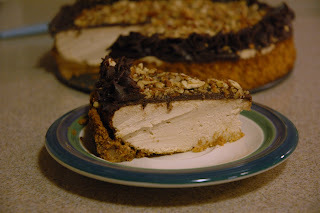 My dad had asked if I had ever made a peanut butter cheesecake? He had asked, because The Cheesecake Factory use to offer a peanut butter cheesecake that he was fond of and he recently discovered that they pulled it from the menu. It didn't surprise me, because how many of us think "peanut butter," when cheesecake comes to mind. I was intrigued by the notion because I love peanut butter and being intimately familiar with making cheesecake, I've never made a peanut butter one. I'm typically not a big fan of cheesecake because they are usually unnecessarily and overwhelming heavy. And if you are a fitness junkie like me, cheesecake is hardly ever on the menu, unless I'm making it. 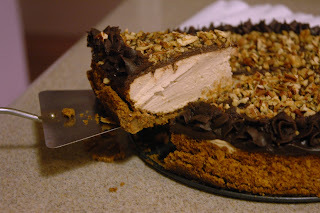 I received a text shortly after that evening from my father, "commissioning" me to make a "light" peanut butter cheesecake. One of the things I love about making cheesecake is the ability to adapt and make them light. 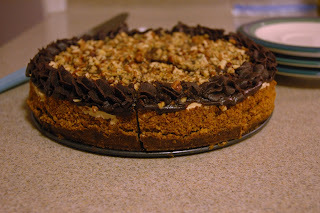 If I'm baking for family, I usually go for light desserts and often times with no sugar added. I know many people would scoff at the idea, but It's an excellent alternative if diabetes, high cholesterol, or hypertension is problem for members of your family. I also, love to challenge myself to the traditional ideas that suggest that everything has to be "full" fat to taste extraordinary. I decide to prepare a cinnamon graham cracker crust which I thought would go well with peanut butter. Creaming together cream cheese, peanut butter, and salt. Here i'm added vanilla and almond extract, egg whites, and sour cream blended just until combined. 1. preheat oven 350 and prepare 9' or 10' springform pan. 2. combine graham cracker crumbs, cinnamon, splenda, and melted butter in a small bowl, mix until moist. Press into a 9' or 10' spring form pan. Prebaked for 8-10 minutes or until crust is golden brown. Remove from the oven and set aside to cool. 3.Make sure all ingredients are at room temperature. In a large mixing bowl, combine cream cheese, peanut butter, splenda, sugar, milk, and salt. Blend on medium - high, until light and fluffy (mixture will be stiff). Then add vanilla, almond extract, and slowly add egg whites blending until just combined. Turn the blender off and with a spatula, gently fold in sour cream until combined. 40mins or until center is set(it will bake faster than most cheesecakes).Take the cheesecake out of the oven and allow it to cool to room temperature. Prepare ganache. In a small bowl melt chocolate chips in the microwave on high 2 minutes with 30 second bursts, taking care not to burn chocolate. Add sour cream and mix until combine add vanilla extract and corn syrup. Next top cheesecake with ganache and sprinkle with toasted pecans. Chill in the frig over night. Enjoy! I love the holidays, because it gives me a reason to bake. Now mind you, to me, any day can be a reason to bake, especially if your doing it for work. But the holidays allow me to really come up with something creatively extraordinary, because there's always a theme involved. St Patrick's day has become ubiquitously synonymous with green. 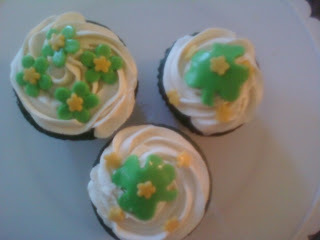 So, I found it only fitting, to use my popular "red" velvet cupcakes and make them "green." I was also in my cake decorating supply store and found clover shaped cutters, which I immediately purchased, thinking that it would make the perfect cupcake topper. 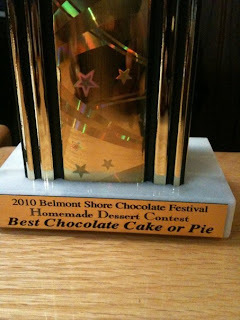 I was excited when I heard that Belmont Shore, a local community in long beach, CA, was going to have their 6Th annual chocolate festival. The event hit me as a total surprise, since I've been living in Long Beach for over 10 years and never heard of it. The only reason I found out, was because a good friend and fellow local Long Beach resident, informed me of the event. I was all over it since, I'm a lover of all things chocolate. After hearing that there was a contest for homemade desserts, I figured what the heck. I also figured that participating in the contest would be a great networking opportunity for Splendid Creations, my business. 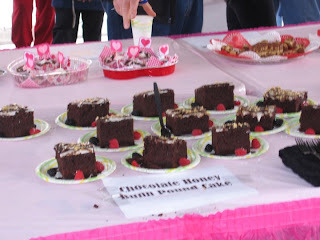 The chocolate tasting contest, had 3 categories: best cake or pie, best cookies or brownies, and best drinks or confections. 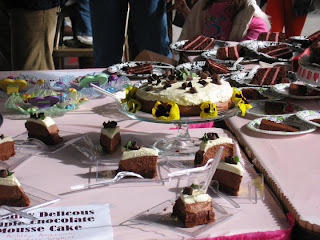 I think the hardest thing about entering a food related contest, is what to enter. But, one of the awesome things about being a pastry chef is the versatility with being able to create all types of baking and pastry dishes. I run a small, yet optimistically growing cake and pastry company, splendid creations and my menu contains plenty of chocolate items. 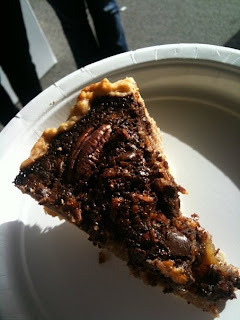 The most popular now being my double chocolate pecan pie (contest winner), triple chocolate mocha cake (or death by chocolate, as my friend calls it), brownies, cookies, and so forth. I knew I had to be smart about which item to enter. I didn't want something too popular and I didn't want something too eccentrically complex. My indecisiveness lead me to family and facebook for an opinion pole. My father chose the pie since it was his favorite and my facebook community, was split down the middle. I went with the pie, because it was a first for most. On the day of the contest, I was pressed for time because the event was the same weekend as the Superbowl and so I was finishing up a Superbowl themed cake. the contest was at 2pm and I baked two pies early that morning. When I arrived at the contest, I had 5 mins to set up and plate. 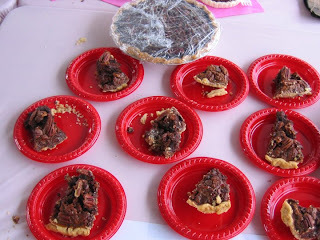 Mind you, when I registered for the contest the prior week, I wasn't told that I needed plates, napkins, forks, etc and since I had only packed my cutting knife, camera, and two pies, I had to run to the local store and pick of the items I needed. I also noticed that this contest was serious. Most of the contestants came with their "A" game. I saw some amazing and beautifully plated dishes. It seriously looked like something off of the food network. Pecan pie is hard to cut normally, so just think of the frustration I experienced, when I had 3 mins to plate. Disaster! I had the worst plated dish out of all the contestants and I decided at the moment that it was all over. 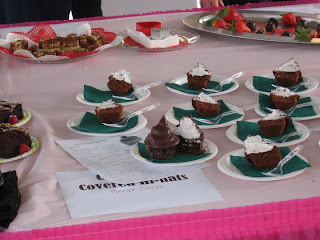 During the contest the 9 judges took their "sweet" times carefully sampling all of the chocolate entries (there were at least 30). I stood there looking at my disastrously plated entry and how the judges were sampling in and around my pie, avoiding it like the plague. My father stood there in support of my efforts, telling me to be patient and watch closely. At last, one of the judges took a sample. I instantly saw her face light up and saw her mouth form a encouraging "WOW." At that moment, she insisted that the other judges try the pie and they did. 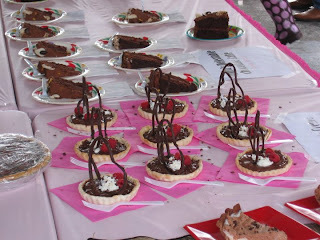 Now mind you, there were 30 or so entries and 9 judges and none of them took more than a small bite of each entry. Three judges ate the entire pie and one even went back for an encore. I was elated, because it put a glimmer of hope back in my spirit. My dad retorted "see they're hooked!" I could only laugh and agree with him. When the contest was over we had about an hour to kill for the judging. I couldn't get over how awful my entry looked. I know they enjoyed the pie, but was taste enough to win? 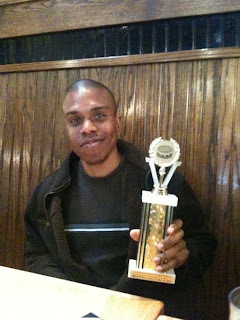 When I won the "cake and pie" category of the contest, my father said something profound, "Taste beats presentation every time." I guess he was right. To Be or Not to be......a Chocolate Cake?? When I originally decided to start blogging, I told myself that I would blog at least once a day. I have to admit, that I haven't been living up to that commitment. As a new blogger, the hardest thing about blogging, is coming up with something of interest. These days millions of people blog and with the threat of sounding ubiquitously redundant, I have to blog in a way that offers unique perspective and insight. With that being said, I hope you find my blogs both interesting, insightful, and fun. I made these Red Velvet cupcakes last weekend for fundraising event at my church . It always blows my mind how often people think of the red velvet cake as a devil's food or chocolate cake with red food coloring added to it. This discussion was prompted by my original post on facebook, when I simply uploaded my pictures. Now, if you've ever had a "real" red velvet cake (not a chocolate or white boxed cake mix with red food coloring added), then you would understand that it hardly taste of anything chocolate, but I guess that would depend on who's making it. If you have ever made a red velvet cake, then you would realize that it is deliciously in a category all of its own. So then why do most people think that it's a "light" chocolate cake? The most intelligent answer, because it contains chocolate, more specifically, cocoa powder. I've seen RV cake recipes that contain anywhere from a teaspoon cocoa, to 1/2 cup cocoa powder. If any single RV cake recipe contains more than 3 tablespoons of cocoa powder, then it is clearly a "light" chocolate cake. That's simply my opinion. So let's talk about the flavor. Most red velvet cake recipes contain: cocoa powder(dutch process or natural), pure vanilla extract (pure), buttermilk (I use sour cream), red food color, and vinegar. Of course we have the dry ingredients: flour, salt, leavening and sugar. Before I came up with my own recipe, I tried several different ones and in every one, the most interesting ingredient that I found was vinegar. I asked myself why in the heck would anyone put vinegar in a cake? Then I thought to myself, vinegar is an acid and the RV cake contains baking soda that would react with the acid and help with the leavening. Then I thought, RV cake also contains buttermilk and cocoa powder (if you're using natural), which are also acidic and should make the batter's Ph acidic enough, to react in the same way. So why then, would you add vinegar to the cake at all? What I found in most recipes, is that we do what's traditional and not what's always discerningly practical. There are different schools of thought on why there is vinegar present in the cake, but that topic is outside the scope of this discussion. I do know that adding the right amount of vinegar gives the red velvet cake a flavor (combined with the other ingredients), that's nothing like a regular chocolate cake. I also noticed that some recipes require that you add the vinegar and buttermilk together and add them at the end of the mixing process, while other recipes state to add the vinegar last. I got mixed results with this step. I add the baking soda with the dry ingredients and I fold the vinegar into the final batter. I choose sour cream to buttermilk for velvety texture and richness and I added an extra amount of pure vanilla extract (as I always do). Red food coloring "could" also contribute to taste. Most people find that in excess, it can taste quite bitter which is true. However, in the right amounts, it might lend it's own uniqueness to the cake. I can't comment on this since I've never tasted food coloring by itself and I don't plan to. So then how do we classify a red velvet cake? If you asked me, in a class of it's own. I'll invited you to try mines if you are anywhere near Los Angeles, CA and be blown away. What are your thoughts on the subject? Happy Baking! As a self proclaimed pastry chef and owner of Splendid Creations I make sure that I keep myself challenged was well as competitive in the industry. My latest projects have me working with fondant and gum paste designs and I couldn't be more ready for the challenge. Although designing cakes is one dimension of my business, I understand how popular 3D style cakes are becoming and so it's important to master the techniques involved, to stay ahead of the competition, especially if most of your sales are cake sales. So, I decided to use my grandfather's 87th birthday as an opportunity to extend my skills in advance 3D cake design. One of the awesome things about "passion" is that it drives our desires and is often times, the obsession with our pursuit of perfection. The cake above is the result. I decided to use my southern banana pudding cake since it's a family favorite next to the Red Velvet Cake of course. 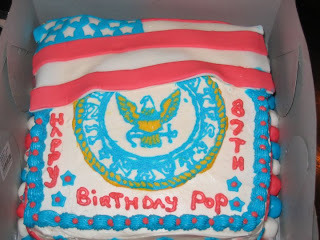 The flag, stars, and bottom border of the cake are fondant and the cake is frosted in the lusciously delicious cream cream frosting. Although my grandfather and family were in awe, I thought the design was just "ok," but the taste of course was out of this world. This is one of many 3D cakes that I will create in the coming weeks. Come to think of it, I have a client that ordered a dice shaped 3D cake for next weekend. Come back if your interested in how it turns out. Thanks for reading and happy baking. Passionate pastry chef, fitness enthusiast and owner of splendid creations. Sharing my passion with you while helping to start a healthy revolution.